Tom has been investing in the Rochester, NY area for several years and has a great perspective on getting started, building systems to manage your business, investing in rural areas (or as Brandon says, “rrrrrurrral”,) and a whole lot more. Don’t miss a second of this excellent interview! Read the transcript for episode 45 with Tom Sylvester here. Investing in Rural Markets: The Secret to Real Estate Investing Success? great tip on the toilet fill valve! Thanks Alex. I wish we would have known about it before our $800 water bill. Hopefully it will save you some money. Thanks Brandon, it was a blast. After listening to this podcast, I went to Home Depot and purchased the Fluidmaster Leak Sentry (i needed them for my new property), and can I just say how AWESOME these are?!?! you can drain the entire tank of water and the fill valve will not utter a drop of water until the handle “activates” the fill valve. this is such a no brainer that I will now replace every fill valve in my toilets with these. thank you! Alex – Great stuff. Thanks for coming back and sharing the real life experience of using them. Another enjoyable podcast, and great to see Tom making it happen in the Rochester area, where I misspent my youth. And Joshua, don’t knock scaring abandoned buildings … it builds character. Thanks Greg. I think I’m going to have to get Josh a ticket out to Rochester. He can have a garbage plate and all will be well. Ha ha Tom … now you’re talkin’! 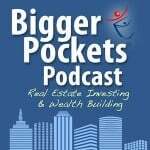 Thank you for another great podcast, just ordered the book by Frank Gallinelli, sounds like a good one, when I am done with that I think I will move on to the BP books on flipping and Rehab costs. Again thanks again for another great Podcast. Thanks Chris. Those books are fantastic. The reason I love both of them is they take these big obscure topics and break them down to the basic. With Frank’s book, he takes all these calculations and actually walks you through a simple example for each formula. I took this a step further and put many of the formulas in a spreadsheet that I use ot evaluate deals (read more here – https://www.biggerpockets.com/blogs/4317/blog_posts/29893-how-to-quickly-evaluate-a-real-estate-deal). J’s books do a similar thing. He goes into a ton of detail with each step of the process and makes it very easy to understand both the sequence and what is involved in each step. Lots of reading between the 2 books, but probably two of the best value books out there for real estate.